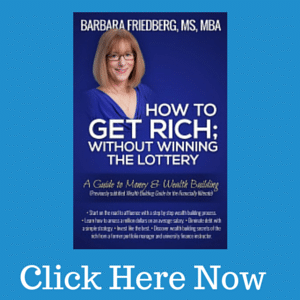 Want to become inspired to improve your money life? Read about influencers who are changing the financial literacy and education landscape. Personal Finance Luminaries is a series highlighting individuals in the money education and information sphere who work to improve the financial lives of individuals in the U.S. and worldwide. Become educated, enlightened and inspired as you read about Rob Pivnick, attorney and author of What All Kids (and adults too) Should Know About . . . Savings and Investing. 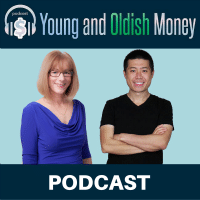 Please check out the list of former personal finance luminaries, they include authors, personal finance website publishers, and well known podcasters. Each one of the luminaries offers a peak into what makes them tic and how they are working to improve the financial lives of others. These personal finance lessons will get you thinking about how to further your money savvy. 1. 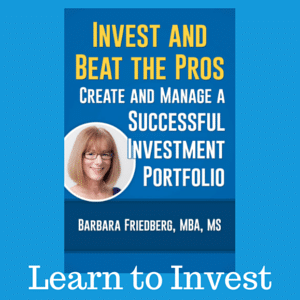 How did an attorney end up writing a personal finance lessons book? When I was 12 my father matched my first investment of $250 in Twentieth Century mutual funds – Select. The fund company is now American Century. It was then that I caught the saving/investing bug. I couldn’t wait for my monthly statement to come in the mail (no electronic statements back then . . . saying that makes me sound old). And any time I saved a few bucks I would invest it (well, I would first iron my money so it was nice and tidy before I took it to the bank. True.). Since then I’ve always put investing as a first line item in my budget. (I think in an alternative life I was a financial planner.) Actually at one point I wanted to be a “stock broker” (with the growth of discount brokerages, online trading and financial planners, I’m not sure that is a profession any longer!). In any event, I wanted my kids to develop good saving and investing habits. So I’ve been taking them to the bank to deposit their allowance and birthday money for years. They each have a few ETFs they’re invested in, and once my oldest was able to understand investing, I figured it was time to teach him best practices for long term investing and ultimately reaching financial independence. 2. What are your money/financial influences? My money lessons were influenced by a variety of sources. I can’t really say that there is one financial icon that I follow, but I suppose I can name a few that have influenced me. I think the most obvious to those who have read the book (or even from below) is Jack Bogle. I have never registered as an official Boglehead, but surely I qualify . . . diversified asset allocation through low cost index ETFs without trying to chase returns or beat the market. And Burton Malkiel who also supports buying index funds to match the market. Hey, how can you argue with Warren Buffett who, despite the phenomenal success of Berkshire Hathaway, earlier this year endorsed low cost passive indexing for his estate and his heirs. 3. Tell us about the money lessons in, What All Kids (and Adults too) Should Know About Saving & Investing. I actually never thought that anyone but my three kids would ever see it. I wrote it for them so they would develop good long term investing habits and not think that they were smarter than the market. Or that they could time the market. Or that they could pick the next great stock. Long term investors know that trying to beat the market is a fool’s game because the market always reverts to its mean. So if I could teach the kids to start early, and be happy with the historical average of around 8.5% return, then by the time they were older and had a family, they would thank me. And since long term buy-and-hold investing isn’t necessarily exciting I wanted them to learn early so they could cut out the noise and invest for the long term. I know they will hear all the pitches about great opportunities and when they’re older one of their buddies will tell them they killed it with some stock they should buy (it’s like Vegas, no one tells you about losing big, but you always hear about it when someone wins big). While my initial audience was my kids, the target audience is really middle grade, high school and millennials. I wrote the book to capture the attention of all those groups. It isn’t too difficult for the young adult, nor is it too simple for the millennial. And it isn’t boring for anyone. I have to admit, the last chapter – “Money is Not Everything” – was hard for me to write because I’m a saver first and foremost. I want to stash it all away. But I know that life is short and who knows how long we’ll be around for, so I had to (grudgingly) include some lessons on enjoying what you have. Plus I understand that part of my target audience – millennials – are stereotypically (but certainly not wrongly) focused on lifestyle, gratification and travel. What’s Up With the “The Takeaways” Section? As to the takeaways . . . well . . . they’re important because the research on financial education has shown that classes do not work. Books do not work (except maybe mine – just kidding). Neither of those things stick with the folks who are learning the material unless the concepts are applied shortly afterwards. What does work is consistency, repetition, hands on application and just-in-time teaching (e.g., a class on mortgages right before someone buys their first house). What also works, the research has shown, is rules of thumb. And, surprisingly, simple rules actually stick better than a thorough lesson on the underlying concept (studies show this). So I added the takeaways as these simple rules that hopefully the reader will remember. Maybe the full explanation gets forgotten, but hopefully the takeaways will stick. How did you find time to write the book with your full time work as an attorney? Short answer: nights and weekends. I just tried to sneak in an hour here and there between work, family, kids sports and kid birthday parties! What are Your Best Personal Finance Lessons? For young adults, college kids and millennials its simple: the best personal finance lesson is to start early. Starting to save as early as possible is the easiest and best way to let your money work for you. Albert Einstein called compounding the eighth wonder of the world. The younger you start, the less important how much saved matters. What matters is that you started early. There are all sorts of examples online about the benefits of compounding. Don’t try to beat the market; invest in indexes. Over the long term it is impossible to consistently beat the market without taking on additional risk. Only 20%-35% of the professionally managed active funds can beat the market. And if the pros can’t do it, why does the average investor think he can do it? And not only can active funds not beat the market, but they charge a full percentage point more on average than passive funds for worse returns! Essentially you are paying more for less. Don’t try and time the market – because you can’t. Buy and hold is the best strategy. The average investor’s annual return is around 5%. That’s compared to the historical average market return of 8.5%. Why? Because we are terrible at investing. We chase returns. We react to fear. We buy into the media hype. And we invest emotionally. In 2008, a record was set for the most outflows of money from domestic equity funds. What happened next? The market has been on an unprecedented climb since then, with returns reaching almost 200% from the market low. And it’s still climbing. And sadly most investors missed out on that recovery. Do not chase returns. Over the long haul, by definition, the market will generate its historical average return. Another way of saying this is that the market reverts to its mean. Short term returns may vary, but the long term returns always revert to the average. Emotional investing is simply a losing strategy. Minimize expenses – invest in low cost index funds/ETFs. We all know that past performance is no indication of future returns (well, new investors may not know that, but hopefully they learn it quickly). What most investors might not know, however, is that the single most accurate predictor of future returns is low fees. When looking at factors such as past performance, manager tenure, expense ratios and Morningstar ratings – expense ratios are the only reliable predictor of future performance. Studies from Vanguard and even Morningstar have shown this. Low expense ratios are the most dependable predictor of good performance. Stay diversified and follow a plan. Diversification has been called the “free lunch” of investing because it’s the only way to lower risk without lowering expected return. 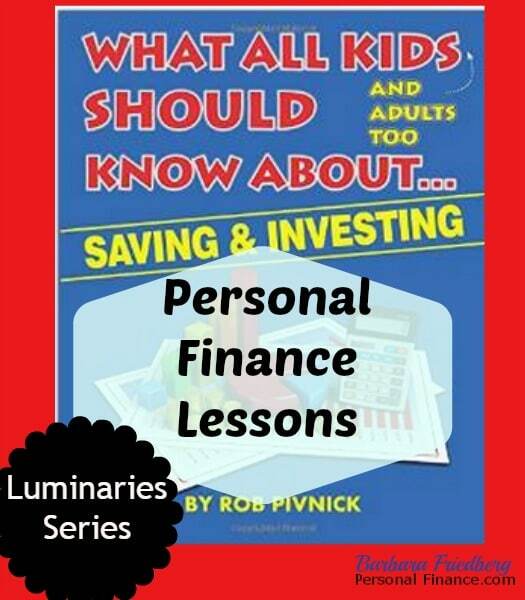 Rob has so many more personal finance lessons, you’ll need to stop by next time to read Part 2 of this Personal Finance Luminary Series. (And if you can’t wait until the next installment of the interview, then pick up his book right now). Rob Pivnick is an investor, entrepreneur, attorney, residential real estate investor and financial literacy advocate. Rob has both a law degree and an M.B.A. from SMU in Dallas, TX. He is a member of the board of directors of the Texas affiliate of the national Council on Economic Education. Professionally, Rob is in-house counsel for Goldman, Sachs and Co. and specializes in finance and real estate. Rob is married with three children. A “boglehead” – I like it!! I agree 100% with Rob’s investment approach and implement it myself. Looks like a good read (if only to reaffirm that I’m doing what I think are the right things) – will have to pick up a copy! @Moneystepper-The book surpasses your expectations, I recommend it. Thanks for the kind word Barb! I’ll keep writing articles if folks keep posting them! Really inspiring post. Ironing the notes before investing shows how determined and serious you were. Investment is something that I do but after reading this post I will put it at the top of my budget. Excellent and inspiring post. @Nick,Saving and investing needs to be the first budget priority if possible. I think the OCD in me “made” me iron the notes! Ha. Do yourself a favor and put your 15-20% savings at the top of your budget and go from there. US average is a mere 4% – we can do better.